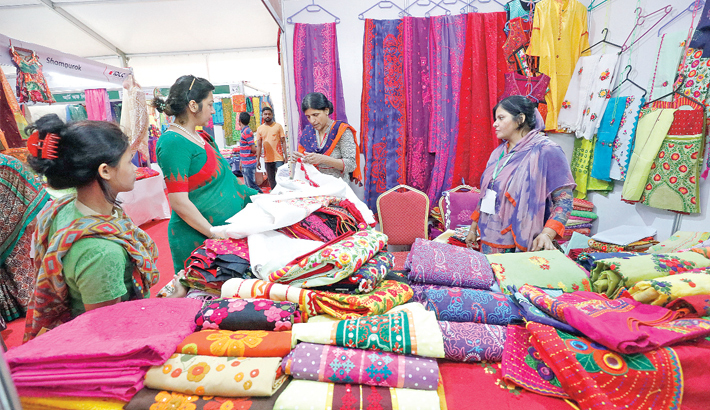 Customers make their choices at a stall of the 7th National SME Fair, organised by SME Foundation, at Bangabandhu International Conference Centre in the capital on Sunday. EXIM Bank Managing Director Dr Mohammed Haider Ali Miah presides over a meeting with business partners of EXIM Bank for Chattogram region at Radisson Blu in Chattogram on Saturday. Bank’s Vice-Chairman Md Abdul Mannan was also present on the occasion. Officers of Rajshahi Krishi Unnayan Bank (RAKUB) led by its General Manager (Audit and Accounts) Md Saidur Rahman place wreaths at the portrait of Bangabandhu Sheikh Mujibur Rahman on the occasion of the 99th birth anniversary at RAKUB head office premises in Rajshahi on Sunday.